This page features some of the advanced lithotripsy equipment utilized by the Kidney Stone Center of the Rocky Mountains. 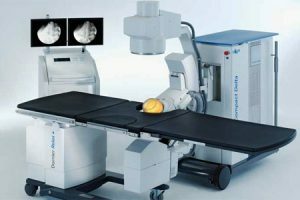 The Dornier Delta Lithotripter combines Dornier's proven Extracorporeal Shock Wave Lithotripsy (ESWL) technology with state-of-the-art imaging and information management options. This system's design avoids the risk of misalignment while ensuring precise stone localization, thus providing an optimal treatment experience.